Home Sports Baseball Is This Luis Castillo’s Sophomore Slump? Is This Luis Castillo’s Sophomore Slump? What’s wrong with Luis Castillo? Last year, at age 24, the right-handed Castillo looked like a potential ace-in-waiting for the Cincinnati Reds. His record was an abysmal 3-7—unnecessary reminder: wins are a dumb way to evaluate pitchers—but he posted a 3.12 ERA, 141 ERA+, and 2.6 WAR in just 15 starts. At times, he looked completely dominant, and Castillo always looked unflappable on the mound, supremely confident in his ability to make big league hitters look silly. So far in 2018…well, not so much. Sure, Castillo is still unflappable, but the results have been a far cry from what we came to expect based on his 2017 results. After five starts, Castillo is 1-3 with a 6.51 ERA and a 62 ERA+. Disastrous, right? Well, it hasn’t been good, as Castillo would likely concede. But things aren’t nearly as dire as they seem on the surface. First of all, it’s just five games. Let’s not pretend that we have a clear picture about anything based upon five games (and 27.2 innings) of baseball. We can, however, look at the trends and see if anything jumps out at us. A cursory glance at the stats does indicate something extremely interesting: Castillo’s xFIP (Expected Fielder Independent Pitching) is 4.03 so far in 2018. xFIP “measures what a player’s ERA would look like over a given period of time if the pitcher were to have experienced league average results on balls in play and league average timing.” (Here’s a primer.) Essentially, it helps us judge a pitcher on the things that are actually in his control. Here’s why that 4.03 xFIP jumped out at me: the league-average FIP so far in 2018 is 4.07. So, by this measure, looking at the things he is actually able to control, Castillo has been somewhere in the neighborhood of an average pitcher this season. That’s a far cry from what we think when we see that 6.51 ERA, no? Further, Castillo’s pitch velocity is down across the board. For example, his average four-seam fastball so far this season has been 96.1 mph. Last year, that number was clocked at 97.7. That decline, of course, could possibly be attributed to the cold weather. You’ll remember, Castillo didn’t make his big league debut until June 23 last year, so we really only got to see him during warm weather. What do you see there? So far in 2018, Castillo is throwing fewer four-seam fastballs and more sinkers, by a substantial margin. This is actually a continuation of something we saw last year, as Castillo progressively threw more sinkers and more changeups as the season went on. That trend has continued through five starts. In fact, in his most recent start, against the St. Louis Cardinals, Castillo threw 89 pitches in his five innings of work, surrendering three runs on seven hits. He threw 38 sinkers in that game, and only 21 four-seam fastballs (to go along with 21 changeups and nine sliders). These charts, however, demonstrate the biggest reason for concern that I could find in the raw data: the four-seam fastball. Not only is his velocity down, but he’s not missing as many bats, and he’s not locating it as well. Hitters are teeing off on the four-seamer to the tune of a .385 batting average and .808 slugging percentage, compared to last year’s numbers of .250 and .523. My first thought was that his increased use of the sinker (and changeup) was a reaction to the fact that his fastball has been less reliable this season. While that might be true to an extent, it ignores the fact that Castillo was trending in that direction (fewer four-seamers, more sinkers) throughout the second half of last season. To me, there has clearly been a decision to work on mastering the sinker, and the results have been spectacular so far this year. The fastball…well, that’s a problem right now, and it’s the single largest culprit in Castillo’s early-season struggles. 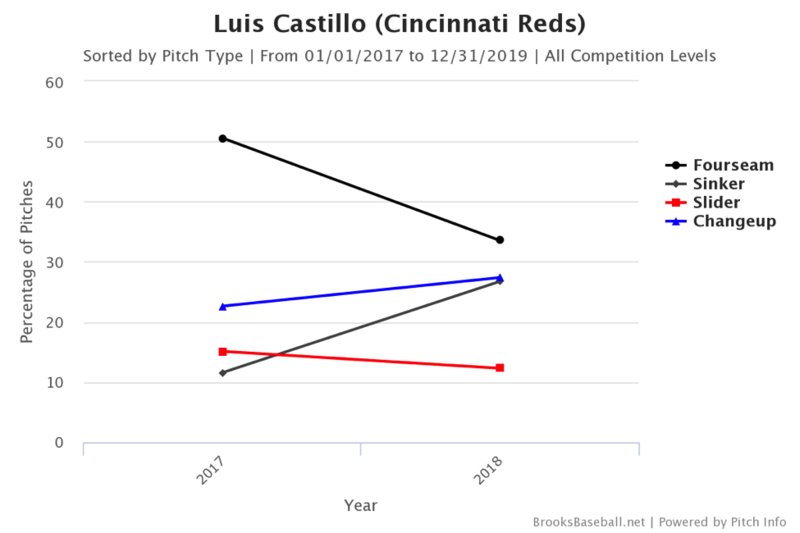 If he can’t regain the command and effectiveness that he showed with the four-seamer last year, Castillo is likely to continue to struggle, no matter how good his other pitches are. On the other hand, if Castillo combines his 2017 four-seam fastball with his 2018 (so far) sinker and changeup, the league had better look out. He’d have the stuff to be an ace, a perennial All-Star, and a Cy Young Award candidate. And it really might happen! Castillo is still young, and young pitchers are notoriously inconsistent as they learn what it takes to be effective against the greatest hitters in the world. He’s only twenty games into his big league career, and we’ve only seen five starts in his sophomore campaign. He’s a work in progress. Someday soon, however, Castillo may just be a work of art. Chad Dotson is a contributor to Nuxhall Way, and the founder of Redleg Nation. His first book, “The Big 50: The Men and Moments that made the Cincinnati Reds” is available now, in bookstores and online.